The dramatic stretch of The Amalfi Coast in Italy, which links Positano to Vietri sul Mare is home to the spectacular town of Amalfi. The coastline is marked by steep rugged mountain cliffs 700 meters high that drop dramatically into the deep blue Mediterranean. These mesmerizing views can never be escaped, viewed from land or from sea. Tucked into the coastline, is this picturesque fishing village, after which the coastline is named. Villa’s, churches and corner shops are built out of the local rock and are on top of each other climbing up the mountain from the water’s edge. Buildings are surrounded by kept gardens and terraces, narrow pebbled streets, endless steps, lemon trees, grape and olive vine’s and the perfume of nature. At the mouth of Valle dei Mulini (Mills’ Valley), the village overlooks the sea with its characteristic set of white houses on the rocks, narrow streets among arches, and ancient towers to guard the town. This is a very picturesque town, characterized by enchanting panoramic views and cliffs rising sheer from the sea; a real Eden with a gentle climate, and delightful beaches. The architectural value of its monuments, the beauty of the landscape and of the seaside, its traditions and food has made it an incomparable place, so that Renato Fucini said: “when people from Amalfi will go to Paradise, it will be an ordinary day for them”. 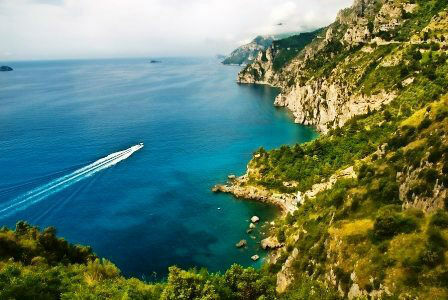 The town from the end of the 9th century to the 1200’s was the seat of the powerful Duchy of Amalfi, a maritime republic. 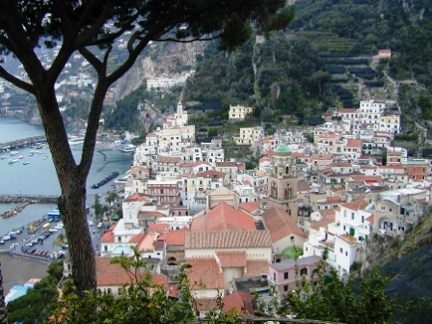 Amalfi lost Its autonomy in the 1200’s with various civilizations laying claim and even sacking the town. At its height of importance, the Duchy of Amalfi rivaled the republics of Pisa and Genoa and was home to 70,000 to 80,000 people. At its height of power, the wealthy Duchy of Amalfi built the Cathedral of St. Andrew in the center of town at the top of 57 steps. 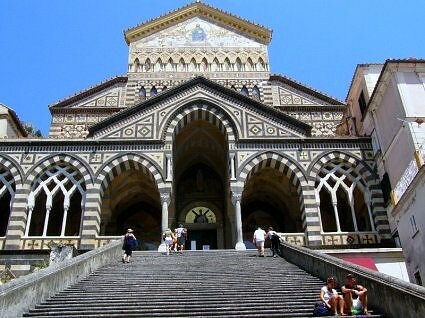 Within the Cathedral are the remains of St. Andrew the patron saint of Amalfi Town. In the 19th century Amalfi was rediscovered as a tourist and cultural destination by many foreign travelers, thanks to a new Romantic Sensibility, so its landscapes, monuments, scenes of daily life, became cause of inspiration for painters, architects, and writers coming from all parts of Europe. In the 1920’s the town was discovered again and became a holiday location for British Aristocracy. 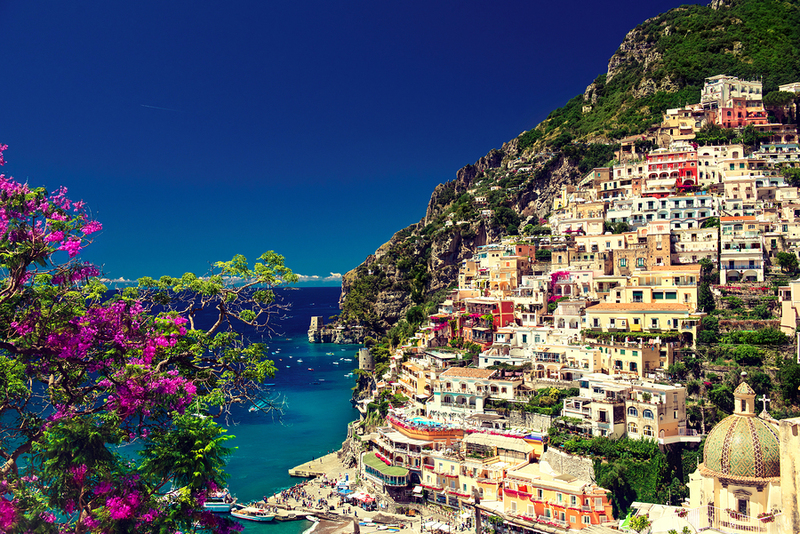 The Amalfi Coast is famed for its production of Limoncello liqueur from the local lemons, “sfusato amalfitano”, grown in terraced groves on the hillsides from February to October. These lemons are at least double the size of other lemons, with a sweet juicy flesh. Use of these lemons when making Limoncello gives this liqueur a special unique flavor. Amalfi has also been well known for making paper since medieval times, making a particular thick paper called “bambagina”. This paper is highly prized in Italy for today wedding invitations, visiting cards, and elegant writing paper. Cathedral of St. Andrew: Built in the Italian Medieval style between years 1000 and 1200, this cathedral is one of the best remaining examples of this unique style. Within, in the crypt, and on the right-hand side of the nave, are the remains of St. Andrew. Located in the center of town, with a stairway of 57 steps leading up to the main front doors. Within visit the Moorish style cloisters, the church and the crypt. Hiking: There are several hiking opportunities in the area. Leaving right from town, is a hike to the Valle delle Ferriere, for which the trail begins and ends in Amalfi Town, and takes about 3 hours to complete; bringing one to lovely water falls, and past lemon groves. There are stairs along this trail. Also, there is a hike up from Amalfi to Ravello perched on the hillside above with an enormous number of steps in this hike that gains 2858 ft at sea level to the top. Some take a taxi up to Ravello and the stairway back down to enjoy the unparalleled views. Paper Mill Museum: Head away from the harbor into the hillside for about 15 minutes to reach this museum. In medieval times, this town was well known for making paper, the art of which was said to have been learnt from the Arabs. The Milano family have converted an old paper mill from the 13th century into a little museum including a “hands on” mini lesson to learn paper making techniques using the ancient presses. The gift shop sells a fine selection of paper made at the museum, along with a good selection of natural inks and quill pens. The Museo Arsenale Amalfi: Located in the Arsenale, within the vaulted stone halls where Amalfi’s ships were once built, this museum showcases the impressive naval history of the town, which between the 9th and 13th centuries was a powerful maritime entity. Within this museum is the Codice Foscariniano, a 17th century compilation of nautical rules drawn up in Amalfi between the 11th and 14th centuries; used as the world’s first international maritime code which continued as the common law of the High Seas until 1570. 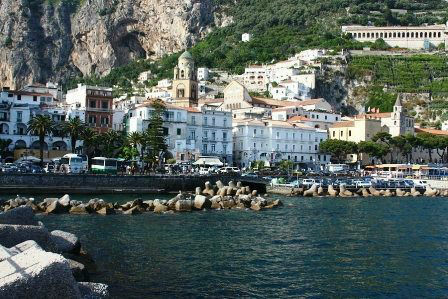 Amalfi Town has an impressive history, particularly as a maritime center when the Duchy of Amalfi in medieval times. Come in today by sea, as thousands have before you, either on the ship’s tender from your charter yacht anchored in the harbor, or depending on the size of the yacht, dock in the one tiny area in the harbor with space for just a few yachts to come in stern to. Wander the steep streets, full of steps and tour the Romanesque Cathedral of St. Andrew. After, enjoy a cooling drink in one of the many cafes lining a lovely piazza and watch the world go by from your perch in Amalfi Town on the Amalfi Coast.